Content is king, right? But that doesn’t necessarily mean you have to write every word of it. After writing blog post after blog post and article after article, with an eBook or white paper thrown in, you may feel as if you’re penning the Great American novel rather than marketing your business. The good news is you don’t have to type until your fingers fall off. Original content is certainly good, but content curation helps get the job done too. In its simplest terms, content curation is the art and science of finding and sharing quality content on a particular topic. It means sorting through topical content on the web and then presenting the highest-quality posts in an organized and meaningful way. You save your audience from having to wade through the tons of available content themselves, and you’re rewarded in terms of engaged audience members who pay attention to what you post and share. Think about an art gallery and the collections of art on display – those collections are carefully manicured and presented in the best possible light. The concept of content curation is similar in that you pick a common thread (a theme or topic) and collect, or curate, the items you want to showcase. In this case, we’re showcasing articles, blog posts, video, photos, podcasts, and infographics, instead of painting and sculptures. Is Content Curation the Same as Content Aggregation? It’s easy to think that content curation and aggregation are the same things but for your reader, it’s the difference between being presented with only the most useful, relevant content versus the 12,343,244 results returned on a Google search. Using our art gallery example, if you were walking into an exhibit on contemporary surrealism, you’d expect to see only the best pieces from the best artists, not every scratch and doodle ever posted on the web. That’s what you are doing for your readers: presenting them with the best of the best. Does Content Curation Mean Creating Content? While, technically, content curation doesn’t mean content creation, it doesn’t mean that the opportunity to create content doesn’t exist. And, in fact, if you’re not creating some content around the items you curate, you are missing the all of the best benefits, and so are your readers. Remember, you are gathering content from a variety of sources and then presenting it in a thoughtful and organized way. “Presenting” is the key word, here. This is your opportunity to create content. Again, thinking of a collection of art: walking through a museum, you are presented with more than a piece of art to study. You are given information about the artist, the inspiration for the piece, the medium used and sometimes even more. Use this same approach when presenting the content you’ve curated. Let your readers know what the article is about, who wrote it and why it’s important or relevant. You can keep your blog both relevant and helpful with weekly posts that curate other people and companies’ content from around the Web. Each post could be on a theme: For a food blog, one week could be all about asparagus recipes, another week about peach recipes. Alternately, you could round up what you consider to be the best or most important news of the week within your topic area into a blog post with links to those news items. Like your weekly blog posts, this type of curated content helps your readers save the time they would have to spend finding great Web content. Want to see an example of this in action? We curate content for our weekly newsletter on social media and content marketing topics. Include curated content directly into your social streams alongside a mix of personal updates, brand mentions, and other content you already share. Whatever format you choose to deliver your curated articles to your readers, keep in mind that it’s important to not only write your take on the piece, but also credit the original author. Not doing so could potentially violate the author’s copyright on the article. When done the right way, content curation can fit into your marketing efforts in a variety of ways. 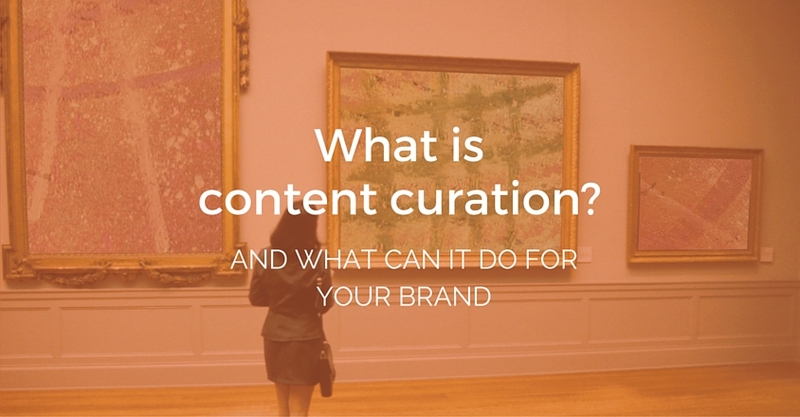 Many brands use curation as part of their content strategy with positive results. We all love recommendations from people we trust, such as friends and peers. But we also desire information from reliable sources that take the time to explain how these recommendations will help us achieve our goals as well as make our lives easier. Curators carefully select content based on their understanding of the audience, even making the pieces easier to relate to if needed. You do this for your audience, giving it to them short and sweet, so they don’t have to struggle to tame the mountain of information out there. Every article, picture, message and video you curate provides a window for your customers to look in and learn about your ideas, interests and work ethic. This can enhance the public perception of your brand. People buy products from brands they think have personality. Dull Davids don’t win here. 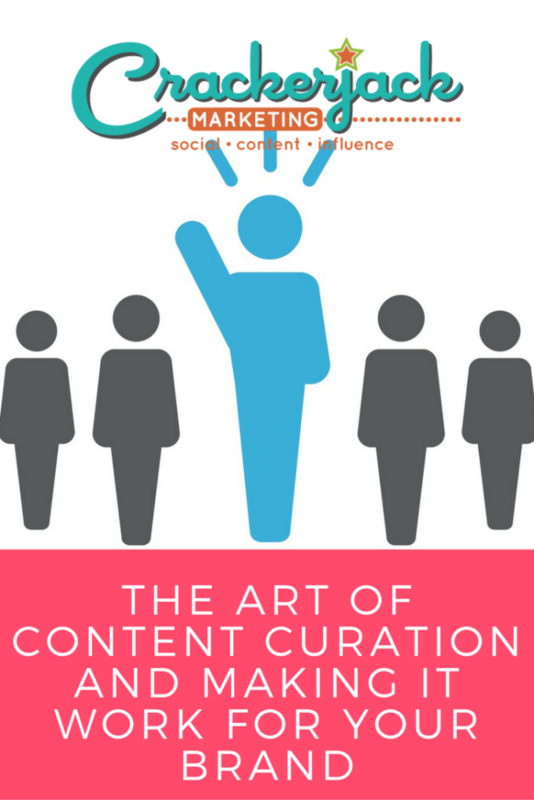 Content curation is a great way to remain engaged with your customers after the sale. Sending news clips or other relevant information to your audience not only keeps them informed but also builds goodwill. And let’s face it: customers can be forgetful. If you’re not right out there talking to them and giving them a reason to think of you, they just may forget to buy from you the next time they need something. With a steady supply of quality content to provide, you can keep yourself fresh on their minds. A key to maintaining a successful blog is to publish posts on a regular basis. While creating great, original content on a daily basis can be a challenge; you can complement your own original work with the curated copy. No blogging blues or splitting headaches because you have to write yet another post! 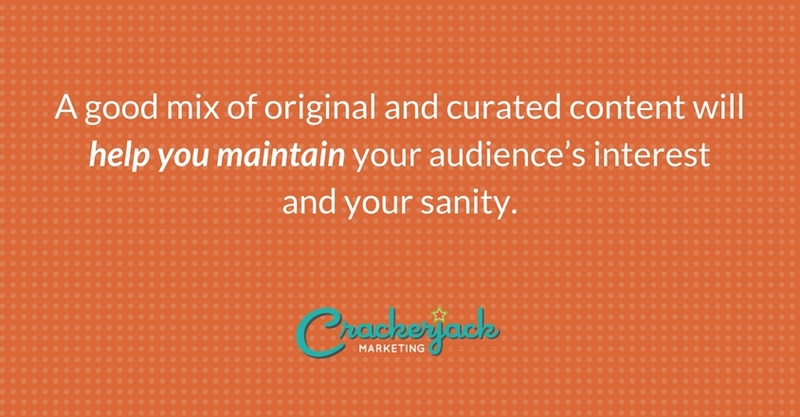 A good mix original and curated content will help you maintain your audience’s interest and your sanity. Too much self-promotion will just turn your audience off, and it doesn’t drive conversions anyway. According to a study by Argyle Social, content curation beats self-promotion five days a week and twice on Sunday. So, let’s address the big question on everyone’s minds right now: Does content curation mean you don’t need to create original content? Sorry, but no. There’s always a need for high-quality, original content. Instead of viewing content curation as a replacement for what you’ve been doing, look at it as a valuable addition to bolstering your current marketing mix. You can never have too many tools in your content marketing arsenal, and content curation is one you definitely don’t want to overlook. Use it to provide more quality content, increase exposure, and help drive engagement.